We hope you are all having a productive and happy week. Today we wanted to give you a comprehensive guide to one of the biggest social media platforms in the world; Facebook. Facebook is the social network that many businesses have a love-hate relationship. Facebook is great because it’s one of the most popular social platforms in the world and therefore allows you to reach a lot of people, and it’s a social network that those of us who aren’t so techy feel comfortable using. However, many people dislike the platform because it tends to be full of ads and has become harder and harder to reach your audience without paying for Facebook advertising. But this shouldn’t deter you, because we’re going to tell you everything you need to know about getting Facebook to work for your business. WHY SHOULD I HAVE A FACEBOOK PAGE? Facebook is a really interactive way of connecting with your clients. Most people are on Facebook at some point every day, so it’s a great place to share your content and updates. Facebook is a wonderful place to share a more personal side of your business and can turn passing visitors into loyal fans. Anyone who has already liked your Facebook page is already interested in what you have to offer, so they are the perfect audience to market your business to. Facebook makes it really easy for your clients to share, like and comment on your content and could even result in new customers! Firstly, you’ll need to set up a Page or Group for your business. This is completely separate from your personal profile. So should you use a Facebook Page or a Facebook Group? Group vs. Page: Basically, a Facebook Page is a great choice if you plan on mainly sharing updates and promotional content. Personally, I think that if you are a photographer a Facebook Page is the way to go. However, Groups are great if you plan to give a sense of exclusivity (especially if you set up a private group) and is great for interaction between members. This is probably best used by businesses running events that need group interaction e.g. a members club. Getting Set Up: You can set up a page here or a group here. Choosing a category for your page can be tricky, but just try to choose the best option that represents your business. Add a Profile Image or Photo: Be consistent with your social media images, so use the same image or logo that you have on Instagram, Twitter etc so that people can recognise your page or group instantly. Create a Cover Image: You want your cover image to be consistent with your other social platforms, just like your profile image, and accurately reflect your style. It is another way to reinforce your brand and your business message. The recommended size of your cover image is 851px wide by 315px high. Saving your image as a .png file type will give your the best quality image for Facebook. Profile Description: Keep it simple, to the point and obvious. Make sure you keep the information the same for your other social media platforms. Fill in as much information as you can so that it is easier for people to find you. Invitations: Send out an invitation through Facebook to your friends and family who might want to join your page. Let your past clients know about your new Facebook Page by sending out an email, and posting updates through Twitter, Instagram, Google+ etc. Add a Like Box: Make it easy for your clients to follow you on Facebook by adding a Facebook like box to your website. Be regular: You should try to post to your Facebook page regularly, around 2-3 times a day. However, Facebook newsfeeds don’t update as quickly as other social media platforms such as Twitter or Instagram, so anymore than that might start to get annoying for your followers. However you want to make sure you have regular content appearing on your page, as this will keep your followers engaged. Scheduling posts ahead of time is a great way to do this. Interact with your followers: Facebook is a great place for interaction between your business and followers. Respond to questions and like their comments so that followers feel valued and that their comments are noticed. Get followers involved: Try to get your readers involved with your Facebook Page. Ask followers questions, encourage interaction. The more you can get your clients involved in your business, the more you can tailor your business to them and turn followers into loyal customers. Use Variety: Use a variety of post styles on your page. Use images, video or just text. The Facebook algorithm likes a variety of content so the more you can mix it up, the more likely your posts are to show up in your readers newsfeeds. What’s your story? Facebook allows you to build your brand and expand your reach. It is a great way to share a fleeting thought, celebrate a milestone, get responses to a questions and get feedback from clients. What are your competitors doing? Now, be aware that checking out your competition shouldn’t be you comparing yourself to their business, but instead a way of seeing what is working for them and what isn’t working so well. This will hopefully give you an insight into the kinds of topics or posts you could be sharing with your audience. Who are you going to follow? Spending time on other people’s pages and groups will benefit your own page. Make a note of what you like and don’t like about other people’s pages. You may be able to implement some of these qualities on your own page and bring in new followers and clients. Add your URL: Use your personal Facebook page to let family and friends know about your business. In the “work” section of the settings, add your website as a workplace and link it to your business Facebook page. This might mean some extra clicks and likes! Social Overload: This is something NOT to do. Don’t link your Facebook page to other social media accounts, so that everything you pin or tweet appears on Facebook. It will overload your follower’s feed and is pretty much a guarantee that they will unlike your page. This is something we do not want to happen. However it is a great idea to link your Instagram and Facebook page, so that if you are at an event or want to post something on the go, you can do so easily. However, be selective with what you tell Instagram to publish to Facebook. Add a call-to-action button: There are now seven pre-made call-to-action buttons that you can choose from for your Facebook Page. These include; sign up, shop now, contact us, book now, use app, watch video and play game. This is a great feature that you can change as often as you need. Maybe you have an offer currently running on your website that followers should “book now”? Or perhaps you have an email newsletter for customers to “sign up” to? Pin important posts: Facebook allows you to “pin” an important post to the top of your Facebook Page. This means that regardless of how many updates you put out to your followers, the pinned post always remains at the top of your page. This is a great way of highlighting important information to your clients. To turn this on, simply click the little arrow dropdown in the corner of your published update and choose “pin to top”. Auto-Posting: There are lots of widgets that can be installed into WordPress so you can automatically post your blog posts to social media platforms. I would recommend the NextScripts: Social Networks Auto Poster which allows you to automatically post your blog posts to Facebook, Twitter and Google+ just by pressing the “publish” button. Schedule Posts: There are lots of social media scheduling programmes to choose from including Hootsuite, CoSchedule and Buffer. Hootsuite can be used for free but only allows you to schedule posts to Twitter and Google+, whereas CoSchedule and Buffer also integrates with Pinterest and LinkedIn. Alternatively, if you are only scheduling posts to Facebook then simply set up a status update as you would normally but instead of clicking “Post”, click on the little clock symbol on the left hand side and some options will open. Here you can select the date and time you would like the post to be published. Then click “schedule”. The best times for posts to go live is between 8pm-10pm on weekdays and 8am-11am on weekends. Insights: Click on the “insights” tab on your Facebook Page allows you to see your Facebook analytics. These are very like Google analytics. You can see when most people are online, where in the world they are located, whether they are male or female, how your posts are performing and what’s popular and what’s not. Alternatively, if you feel overwhelmed or simply don’t have time to set up a Facebook business page yourself, you can sign up for our Social Media Service here! 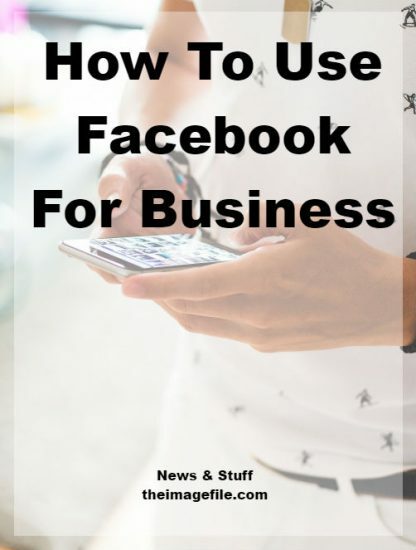 Do you use Facebook for your business? How does it work for you? Is Facebook something you would consider using for your own business?